The Underfall Yard sits at the western end of Bristol’s Floating Harbour, a cluster of Victorian redbrick buildings, reminding us of the Harbour’s industrial history. Over the last few years, more and more of it has been opened up, from the Visitors Centre to providing new walking routes around the end of the docks. It can seem a bit chaotic, full of skips, piles of wood and metal, with whatever’s been dragged out of the Harbour recently – but that, to me, is part of its charm. 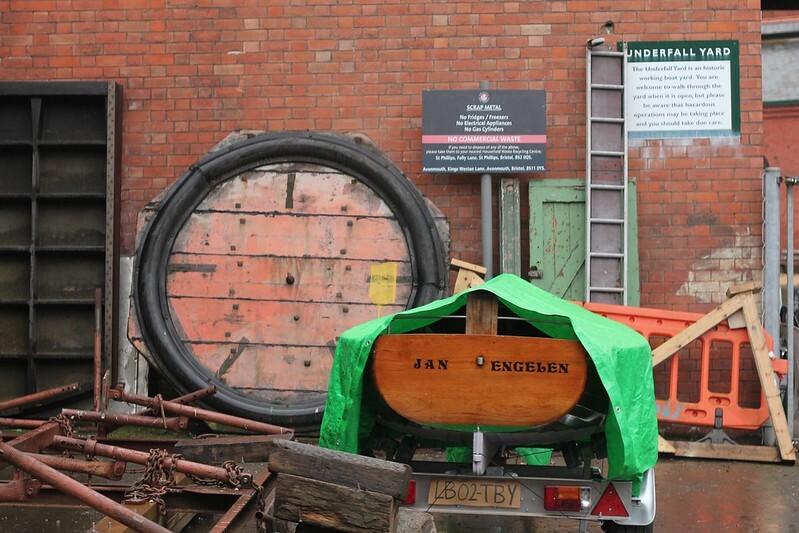 I’ve loved getting to see more of it during the Docks Heritage Weekend, Bristol Harbour Festival and Doors Open Days, but I always want to know more – and I was delighted when Sarah Murray, the Underfall Yard Trust‘s Community, Learning & Volunteering Manager, took me on a bespoke tour. You can join us, as Sarah showed me some of the backstage and hidden sides of the Yard, including the Sluice Room, Engine Shed and Visitor Centre, and told me about the history of how the Yard came to be, and has changed over time, as well as showing me some of her favourite things. A lot of our conversation was about the different ways the Yard’s work involves balancing. It has an important role in keeping the Harbour level, protecting the City from flooding, but there are other day-to-day balancing acts, between being a Heritage site and the base of the Harbour Master and Docks Engineers; hosting tourists and businesses with very physical work; being open for commuters, walkers and joggers, while needing to close for safety reasons; and wanting to attract a good number of visitors, but not too many. I’ve been thinking a lot about how to run a site as a living, working space, while showing off the heritage aspects, ever since. For more information about the Underfall Yard, head to their website – and follow their excellent instagram and twitter, for day-to-day glimpses into the Yard and their work. There’s a lot of information there, about their history, events that they run, visits for schools and colleges and other groups – as well as how to volunteer at the Yard, in different roles. If you want to know more about boat building at the Yard, I have a mini-podcast with John Raymond-Barker of RB Boatbuilding, with photos of what it’s like inside The Big Shed, over here. It’s the Bristol Balloon Fiesta this weekend, and they’re notorious for not saying whether the mass launches will happen or not – so I set the alarm for 5:30am (ugh) yesterday to try to see the 6am ascent, but fell asleep before they confirmed it would happen. Then the evenings have been too windy for the launches, so I made myself get up for the 6am launch today. I’ve been dreaming about getting a film of something we experienced a few years ago – a stream of balloons floating along the Avon. I’ve seen the mass ascent from the Fiesta once, and it’s fine, but I really want that river-of-balloons echoing the river, and to record the roaring of the burners. I was so pleased with myself for being up early, in the beautiful morning light, and watching the balloons from Vauxhall Bridge felt great, I was convinced it was going to happen… until we realised the wind was taking them east, away from us. 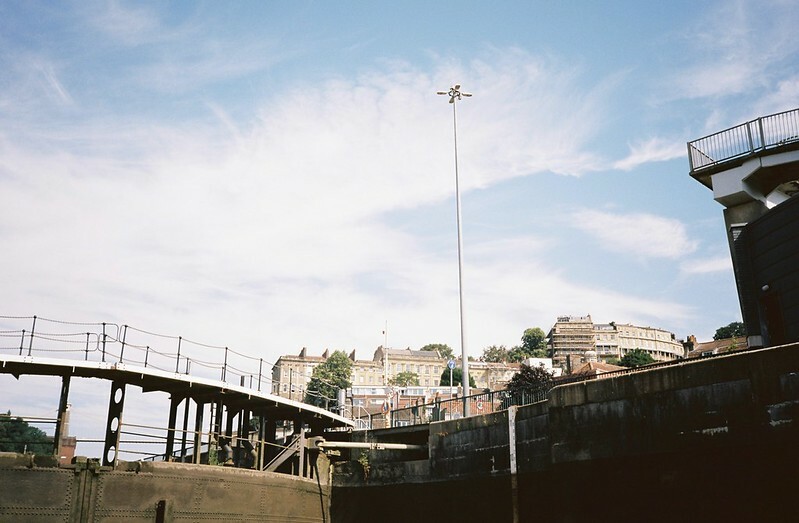 During my photography degree, I made a series of films from the bridge on the Chocolate Path, above the sluices from the Underfall, recording the different ways the water reacted according to the weather, tide, and if water was being released from the Floating Harbour into the Avon. I loved standing still in the same place, watching the water, listening to traffic mingling with birdsong, having these meditative moments just being by the river. I love this spot in any mood – the rush of water being released at low tide; how it can be so slow one day, and so fast the next; the almost volcanic eruptions when the outflow is released below the surface; the way objects move around this little inlet; watching the rain on the water. Three years ago this week, my final Degree Show included a long piece, where I recorded the water rising, and the debris on the surface making beautiful patterns. So it feels appropriate to start this new project by re-visiting these films – there are a lot more on my Vimeo, and in my flickr album dedicated to the Outflow, and I’m sure I’ll be back to this spot often, and be making more of these.